The city of Aachen is Germany's westernmost city in close proximity to the Netherlands and Belgium. It was the capital city of the Holy Roman Empire under Emperor Charlemagne and served as coronation place of the German kings for more than 600 years. Aachen retains a medieval charm from a long history that traces back to Roman times. the Imperial Cathedral with the Palatinate Chapel of Charlemagne is ranked by UNESCO as a World Heritage Site. Aachen's picturesque city centre invites you to stroll through romantic alleyways, discover charming town squares and take a rest at one of the countless cosy little cafes. Today, Aachen is also a city of sciences. As one of the largest technical universities in Western Europe, RWTH Aachen University is internationally known for its high quality teaching and research activities in the field of engineering sciences. Since 2007 RWTH Aachen University belongs to the German Universities' Excellence Initiative. 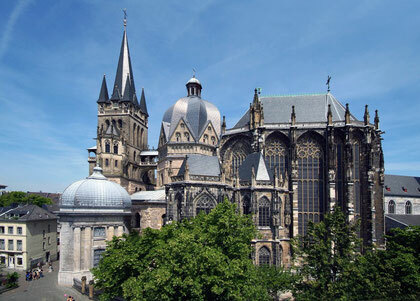 You find comprehensive information about the city of Aachen, its sightseeing highlights and its prominent cultural events on the webpages of the aachen tourist service e.v..